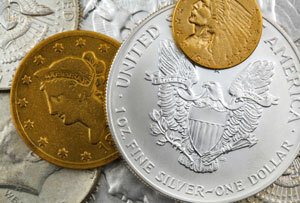 Silver Investment News: How Much Gold, Silver, and Rare Coins Should You Own? How Much Gold, Silver, and Rare Coins Should You Own? A question I am frequently asked by both new and experienced buyers of precious metals is just how much of one’s portfolio should be devoted to gold, silver, and rare coins? There is no one-size-fits-all answer to this question. Factors that affect the allocation decision include someone’s current financial position, their amount of liquid assets, their age, the level of potential risk versus reward they can accept, and their commitments that may tie up assets in the future. To help people, I have come up with a range of answers, using the percentage of net worth as the standard. For some it may be easier to think in terms of percentage of an investment portfolio. The easy part is how much of someone’s net worth in total should be allocated to hard assets. For the conservative person, who may need quick access to cash for living expenses or may have a short time frame for ownership, I currently recommend a 10% allocation. I consider this to be the bare minimum to hold for insurance purposes. Gold, silver and rare coins tend to rise in value when the values of stocks, bonds, currencies, real estate, and other assets are falling. They also tend to rise when inflation is running rampant. Professional planners have confirmed that investment portfolios that own some amount of what I call hard assets tend to perform better over time than those that omit precious metals. For a moderate investor, I now recommend approximately 20% of net worth or of an investment portfolio be allocated to gold, silver, and numismatic coins. For the aggressive investors, which includes people who have significant liquid assets that need not be touched for a long time (at least five years), expect to live long enough to enjoy long-term appreciation, and are comfortable with a higher risk of loss, I suggest at least 25% but no more than a 33% allocation to precious metals and rare coins. Under no circumstances do I suggest that anyone unload all their other assets and focus exclusively on gold, silver, and numismatics. Having all assets from just one investment class would be even riskier than not owning any hard assets. OK, so now you can place yourself in a comfortable spot on the spectrum between conservative and aggressive, calculate your net worth or your total investment portfolio, and figure out how much you want to devote to hard assets in total. The next question that people then ask is how much should they allocate among gold, silver, or rare coins. Silver is a more volatile metal than gold in its price movements. In bull markets, it will appreciate more than gold. In weak markets, it will decline by a greater percentage than gold. I use the gold/silver ratio to give me some clues as to which metal I expect to outperform the other in the future. Some analysts insist that a ratio like 16:1 is the long-term equilibrium ratio. I don’t know that this makes sense any more. However, I am much more comfortable projecting an eventual ratio in the range of 35:1 to 40:1. Since the gold/silver ratio now is in the mid-60s, that indicates that silver has the better prospects from here into the future. Accordingly, I allocate a somewhat higher percentage to silver than to gold, though I think it makes sense to have a significant allocation to both metals. For conservative investors, I suggest that they avoid owning any rare coins at all for investment. Rare coins have a wider buy/sell spread than bullion, normally require a longer time for holding, and are less liquid. You may own some numismatic coins for the pleasure of ownership, but do not consider them as part of your investments. Thus, my conservative allocation would be 40% to bullion-priced physical gold, 60% to bullion-priced physical silver, and 0% to rare coins. For a moderate person, I consider a small allocation to numismatics to be reasonable. So, for them I suggest an allocation of 35% to bullion-priced physical gold, 55% to bullion-priced physical silver, and 10% to rare coins. As for the aggressive investor, I tilt even more toward numismatics and silver and somewhat less to gold. For this person, I recommend an allocation of 25% to bullion-priced physical gold, 50% to bullion-priced physical silver, and 25% devoted to rare coins. I emphasize the purchase of physical gold and silver. And take delivery! There are a number of pitfalls of “paper” precious metals where I judge the risks of the seller or storage company defaulting on delivery are high enough to avoid them. Consequently, I don’t recommend certificate programs, London Bullion Market Association contracts, commodity contracts, allocated or unallocated storage arrangements (segregated storage accounts in your own name should be safe), and exchange traded funds. In my precious metals and rare coin allocations, I purposely did not include either platinum or palladium. Neither metal had any significant use as circulating money in the past. The platinum market is running a surplus about half of the past decade, while palladium supplies have exceeded demand every year in the past decade. These two metals may do well in the future, but I expect gold and silver to outperform them on a percentage basis. By finding your place on the investment spectrum and considering the allocations listed above, I anticipate that you will enjoy solid long-term results compared to many other asset classes. Patrick A. Heller owns Liberty Coin Service in Lansing, Michigan and writes "Liberty's Outlook," a monthly newsletter covering rare coins and precious metals. Past issues can be found online at http://www.libertycoinservice.com/ Pat Heller is also the gold market commentator for Numismatic News. Past columns online at http://numismaster.com/ under “News & Articles". His periodic radio interviews can be heard on WILS 1320 AM in Lansing, www.talkLansing.net, and on www.yourcontrarian.com.